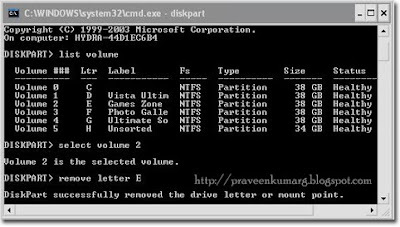 Here is a very cool and simple trick to hide any partition of our hard drive on computer. Many times we will think of hiding some confidential data form others.I have shown two easy methods to hide partitions without using any software. Here I have shown how to hide E drive. 5. In My PC it is volume 2 for drive E .
6. Now to hide drive E type Select volume 2 . 7. Then type remove letter e , this will hide your drive. 8. Now to get your drive back type Select volume 2 and then type assign letter e.
8. Now can find your partition will be hidden. 10. Now select Add option. 11. In that Assign the following drive letter.